Sidelights on Shakespeare - an Interdisciplinary Seminar Series. All staff and student members welcome. Thursday 15th October, Professor Gary Watt (Warwick Law School). Our first ever Sidelights on Shakespeare speaker, Professor Gary Watt, will return to speak on ‘Shakespeare’s Testamentary Performance’. A winner of national prizes for teaching, Gary draws on many years’ experience delivering rhetoric workshops for the Royal Shakespeare Company to show that Shakespeare is playful with legal technicality rather than obedient to it. Gary will demonstrate how Shakespeare transformed manual book rhetoric into powerful drama through a stirring combination of word, metre, movement and physical stage material, producing a mode of performance that was truly testamentary in its power to engage the witnessing public. Building on monographs on law and literature, law and dress, and the co-edited collection ‘Shakespeare and the Law’, Gary’s presentation offers thoughts from Shakespeare’s Acts of Will: Law, Testament and Properties of Performance which will be published by Bloomsbury (The Arden Shakespeare) in 2016 on the 400th anniversary of Shakespeare’s will. Tuesday 3rd November, Stuart Elden, Professor of Political Theory and Geography (Warwick). Originally given as a Sidelights on Shakespeare seminar, February 2014, Dr Catherine Alexander's paper 'Shakespeare and War' has become the most downloaded article from Exchanges, the Warwick University on-line journal, with over 500 downloads. Volumne 1 (2) of Exchanges featured a Sidelights on Shakespeare themed section which is itself amongst the top 5 downloads from the periodical. 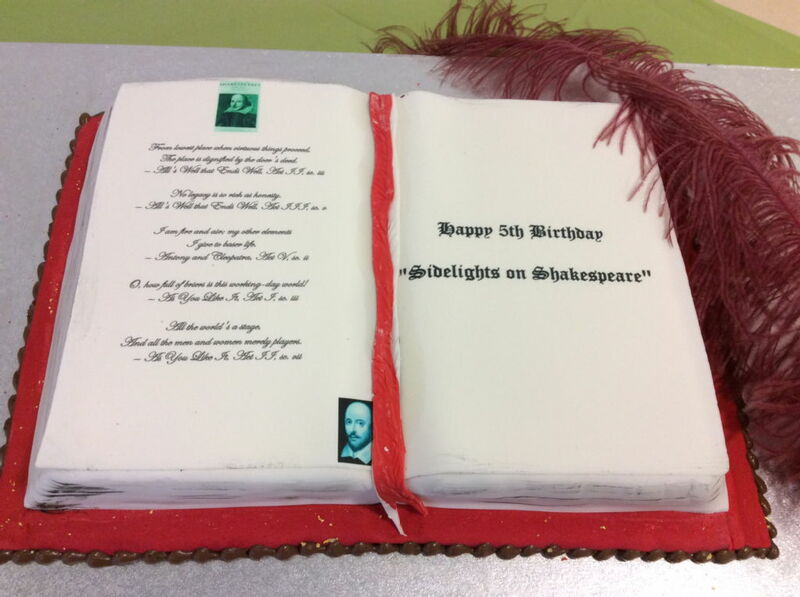 Happy 5th Birthday Sidelights on Shakespeare! Dr Catherine Alexander (Shakespeare Institute, Birmingham); Professor Jonathan Bate (Warwick); Thomasin Bailey (Co-organizer); Dr Paul Botley (Warwick) ; Dr Hannah Grainger-Clemson (Editor, Exchanges Journal); John Curtis (Barrister); Susan Dibben (Humanities Research Centre); Andrew Dickson (The Guardian); Professor Thomas Docherty (Warwick); Professor Ewan Fernie (Shakespeare Institute, Birmingham); Professor Tony Howard (Warwick); Alice Leonard (Co-founder); Dr Peter Kirwan (Nottingham) co-founder; Dr Raphael Lyne (Cambridge); Anna Marsland (RSC); Professor Jonothan Neelands (Institute of Education, Warwick); Dr Sarah Olive (York); Dr Paul Prescott (Warwick); Emma Poltrack (Co-organizer) Dr Erin Sullivan (Shakespeare Institute, Birmingham); Stephanie Tillotson (Co-organizer) ;Professor Gary Watt (School of Law, Warwick). 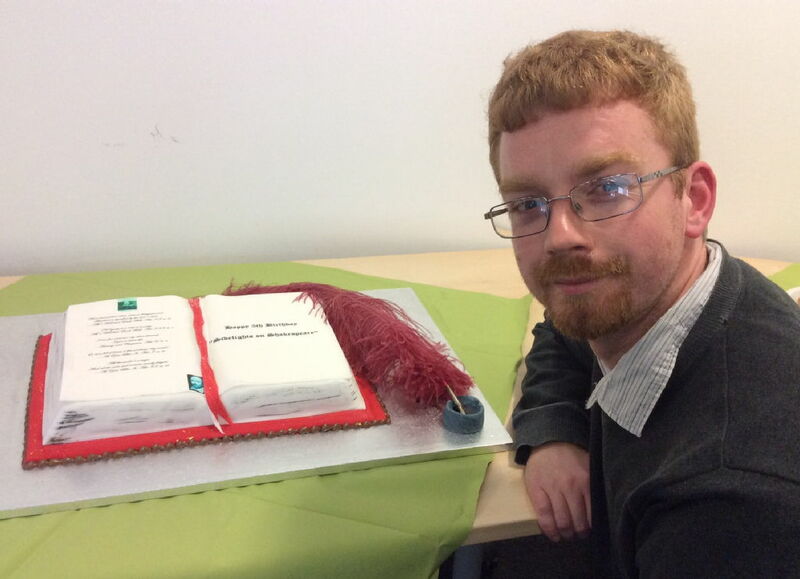 Dr Peter Kirwan prepares to cut the Sidelights on Shakespeare 5th birthday cake. To celebrate our 5th birthday, Sidelights on Shakespeare was delighted to welcome back Dr Peter Kirwan. Now Assistant Professor of Shakespeare and Early Modern Drama at the University of Nottingham, in 2010, whilst he was a PhD student at Warwick, Peter was one of the founders of Sidelights on Shakespeare . It seemed particularly fitting that he should be our final guest speaker in 2014/15, bringing our anniversary year to a close. Dr Kirwan’s paper, 'The Incomplete Works of William Shakespeare: Handling the Apocrypha' opened up key questions surrounding the so-called ‘Shakespeare Apocrypha’ in light of the most current developments in Shakespeare editorial practice. As new major ‘Complete Works’ projects seek to consolidate the constitution of the canon while other multi-volume series add ever more plays, Peter asked what is at stake in editing and author-ising those plays whose authorship may never be resolved beyond doubt? 'Certain o'er incertainty’: eliding Troilus and Cressida’s ambiguity in the Lewis episode ‘Generation of Vipers’. Troilus and Cressida may appear an unusual choice for appropriation in Lewis, a detective drama drawing on the traditions of Golden Age crime fiction: particularly given the genre’s need for ultimate certainty to conquer initial ambiguity and for multiple possible meanings to give way to a single, fixed interpretation of ‘whodunit’. Yet, in appropriating the play, Dr Olive argued that the episode stakes its identity as part of a richly allusive series. This paper considered the history of Shakespearean appropriation in one long-running UK television franchise and the dilemmas facing its 2015 season. Dr Sarah Olive's research is primarily concerned with Shakespeare’s afterlives, particularly the way he inhabits education and culture internationally. In terms of education, this ranges from his place in national curricula to the pedagogies used by theatre education departments. Sarah is particularly interested in the cultural appropriation and adaptation of Shakespeare by television, popular music and the novel. Sarah is currently the Chair of the British Shakespeare Association’s Education Committee and edits the magazine Teaching Shakespeare. Anna Marsland, Assitant Director on the 'Roaring Girls' Season' at the Royal Shakespeare Company discussed her professional life in a Q and A discussion led by Dr Teresa Grant and Dr Paul Prescott. Anna trained in theatre directing at Birkbeck College, London and has since worked at the Royal Exchange, Manchester, Theatre Royal, Haymarket, The Sam Wanamaker Playhouse and Shakespeare's Globe. 2014 has been her debut season at the RSC where she worked in The Swan Theatre on The White Devil and The Roaring Girl. Shakespeare On the Road: A Summer exploring the special relationship between the US and Shakespeare. 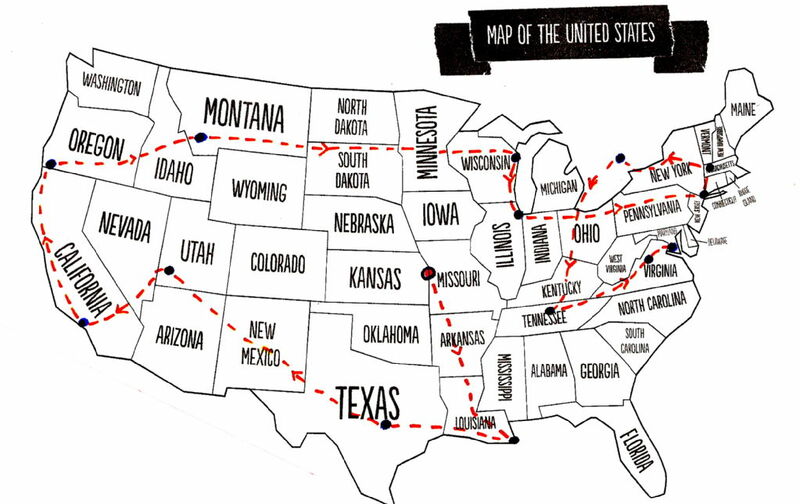 In the summer of 2014, Dr Paul Prescott led a team that undertook an epic road trip, visiting fourteen Shakespeare festivals across the length and breadth of the US (with one notable Canadian incursion). The team conducted over 150 interviews with North Americans of all backgrounds and from all walks of life who – year in, year out – make Shakespeare happen across the continent. Volumne 1 (2) of Exchanges featured a themed section dedicated to the research work of Sidelights on Shakespeare and is still available on-line. Follow the link below to find articles by past speakers John Curtis, Cath Alexander and co-organizer, Stephanie Tillotson. 'Sidelights on Shakespeare' has been running at Warwick University since 2010 and its roll of excellent speakers is developing into a who's who of contemporary Shakespeare scholarship. Our objective: constantly to search out, and bring to wider attention, innovative and interesting perpectives on all things Shakespeare. 'Sidelights on Shakespeare' exists to embrace the plurality of Shakespeare(s), both historical and contemporary. Each year our aim is to offer unusual and thought-provoking approaches, presented by scholars working in a diverse range of faculties, disciplines and theoretical fields. Through sideways explorations of the ways in which aspects of Shakespeare are interpreted, packaged, enlisted and attacked, the series identifies what it is that continues to make Shakespeare culturally so important. If you are interested in helping organize the future of Sidelights on Shakespeare, we would be delighted to hear from you.